FROM AN 80'S SCAMPER TRAILER DINER. EARTH TONES. IN SERVICEABLE SHAPE WITH NO TEARS OR STAINS. COULD USE A CLEANING. ZIPPERED COVERS. MAKES ABOUT A 6 FT - 4" BED. MEASUREMENTS IN PICS. 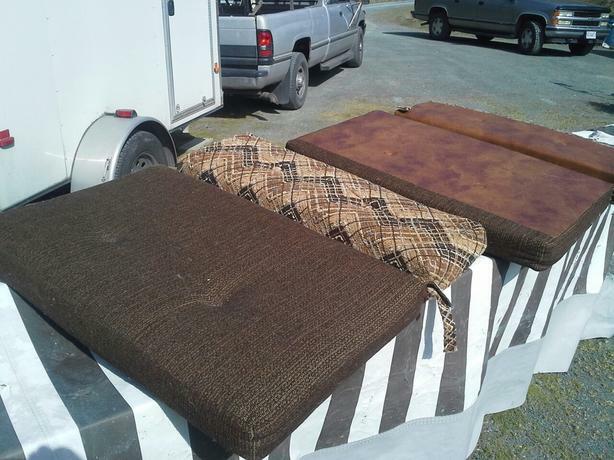 DON'T WANT TO THROW THEM OUT AS THEY'D WORK GOOD FOR A CAMPER/TRAILER W.H.Y.? IN METCHOSIN NEAR PEDDER BAY.